At the market, put your fruits and vegetables into our reusable Washable Produce Bags where they can be scanned through the bags at checkout. At home, safely refrigerate and wash produce right in the bag, then reuse over and over. 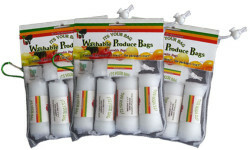 Welcome to our Washable Produce Bags website. Feel free to look around. We only do reusable produce bags because single use plastic produce bags create a lot of waste that ends up in our landfills, rivers, and oceans. It’s so important to us, we don’t even mind if you use another brand. But we think ours are better and we invite you to check out the video, read on, and learn why. 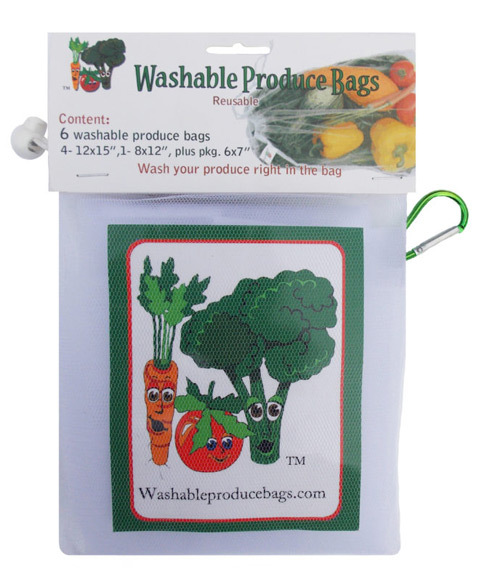 Washable Produce Bags are made from super strong 100% nylon to carry the bulkiest of items. The rip-resistant nylon mesh lets you wash produce right in the bag and can also serves as a scrubby to help wash away contaminates. 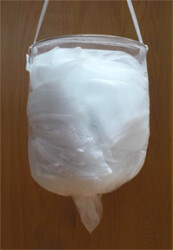 The bags are easily washed and can be used over and over. 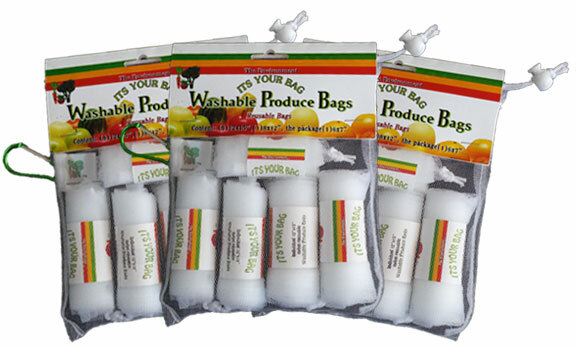 Each set contains (4) 12”x15”, (1) 8”x12″ and (1) 6″X7″ (outer packaging with a carabiner ) reusable Washable Produce Bags. Each bag is rolled up with a “The Environment- It’s Your Bag” band around them $8.99. You can never have too many Washable Produce Bags. 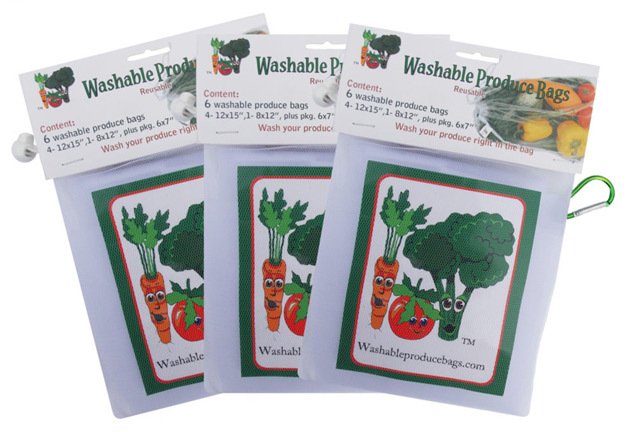 The three-pack includes eighteen super strong 100% nylon Washable Produce Bags. At the checkout counter, the large mesh design lets you scan your produce through the bags, and at home, you can store and wash your produce right in the bags. When the bags gets dirty, simply wash off and reuse. 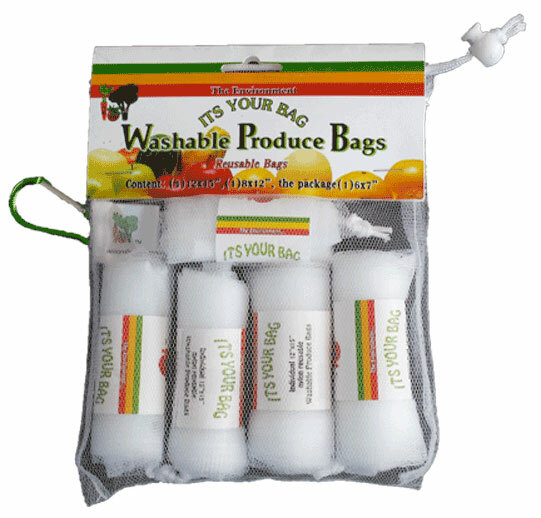 Each Three-Pack contains (12) 12” x 15”, (3) 8” x 12” and packaged in (3) 6″ x 7″ reusable Washable Produce Bags with a “The Environment-It’s Your Bag” band around the bags $21.95. Usually for big kitchens or retail environments, the Basket of Bags provides maximum visibility and accessibility. With this nylon mesh basket filled with (50) individual 12”x15” reusable Washable Produce Bags, your bag-shortage worries are over. Let your kitchen staff or shoppers have convenient access to this versatile and sturdy 100% nylon bag. They will love the convenience of washing produce right in the bag, and since they don’t retain moisture, simply shake off and reuse. $49.95.